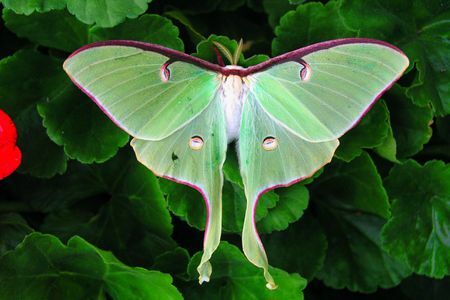 Na na na na na na na na… Mothman? Evolution is a war. An arms race that’s lasted millions of years. Like the war between moths…and BATS! Bats use echolocation — high-pitched sounds — to see and hunt, like sonar in submarines. And what do they hunt? Moths! In turn, many moths evolved sonar-blocking survival strategies. How? Meet Jesse Barber at Boise State University and Akito Kawahara at the University of Florida. They wanted to learn how anti-bat traits evolved in Saturniid moths. These moths are big and silky. Some have long tails on their rear wings. Picture a butterfly. . . with pigtails. The team adjusted the moths’ tail length, either by trimming or gluing on extensions. Then, they introduced the made-over moths to a new roommate: a hungry bat! Result? Longer tails, longer lives! Long tails twisting in flight confuse the bat into thinking there are TWO moths. An acoustic illusion! Moth tails are MADE to fuzz up bat sonar! Maybe this explains why the mysterious Mothman is so elusive!